Mike Conley scored 20 points against the Thunder, the seventh game this season he has scored at least 20. MEMPHIS, Tenn. — Memphis is still beat up and still getting beaten up. 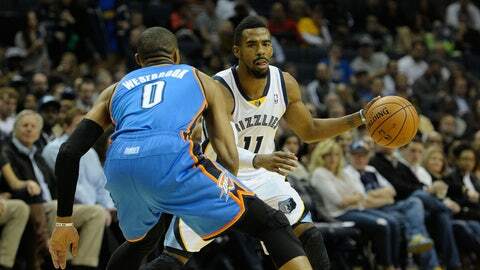 Oklahoma City dropped the Grizzlies to 10-11 overall Wednesday with a 116-100 win at FedExForum. Russell Westbrook scored a game-high 27 points for the Thunder (17-4). Here are three takeaways from the still Gasol-less Grizzlies. When Memphis beat Oklahoma City in May’s playoff series, the question became whether or not Memphis would have been able to do it if Russell Westbrook had been healthy. Oklahoma City did the slapping around Wednesday, but it was Memphis this time missing key pieces. Center Marc Gasol may not be back until February with a sprained left MCL. Starter and top defender Tony Allen is still day-to-day with a right hip contusion. Reserve power forward Ed Davis is day-to-day with a left ankle sprain and Quincy Pondexter is done for the season with a stress fracture in his right foot. "You’ve got to realize, they didn’t have Marc Gasol or Tony Allen," said Thunder forward Kevin Durant. "That changes their whole team. Marc Gasol is a guy that can pass from high post, score in the low post, shoot that jump shot. He does a lot for them. They really miss him." Durant finished with 18 points and six boards. Memphis is 3-5 without Gasol, the reigning Defensive Player of the Year, but also half of Memphis’ offensive scheme with power forward Zach Randolph. Without him, teams are doubling Randolph, who had 17 points and eight rebounds. Gasol’s replacement, Kosta Koufos had 12 points and seven boards. Points in the paint were even at 44, but it took Memphis nine more shots to get there and OKC out-rebounded the Grizzlies by nine. "You’ve got to put this thing in perspective," Durant said. "If Gasol was there, it would definitely be different. Our game plan would be different, but you still have to respect the guys on the court." When Dave Joerger took over for Lionel Hollins, he spoke early about a quicker tempo, not necessarily up-tempo, but getting the ball across midcourt with 20 seconds to play with. Memphis though, has become quite familiar with the shot clock buzzer. The Grizzlies have streaks of disoriented possessions. One came Wednesday in the first quarter. Tayshaun Prince’s steal was wasted when Jamaal Franklin missed a lay-up and Prince a shot from point-blank range off the offensive glass. "Once they put their hands on us, we got a little frantic," Joerger said. "If you’ve got a shot, you’ve got to take a shot. Our bad offense turned into offense for them." Prince had an airball in the second quarter as the shot clock expired and Durant single-handedly broke up a three-on-one fastbreak. Memphis took a 30-29 lead on a Mike Miller 3-pointer, but then looked too happy to pass at times. After one of those times, OKC took a 44-37 lead on a Durant dunk. A Memphis turnover later and it was 46-37 on a Steven Adams’ bucket. A miss later, Westbrook to Durant made it 48-37. Another airball followed — at the shot clock no less. The Thunder closed the first half on a 20-8 run and led by as many as 24 in the second half.Joerger didn’t have an answer for why the clock is running down before the Grizzlies take a shot. "I mentioned it in seven timeouts," Joerger said, then smiled. "I’d rather take an early shot that’s a good shot. You may not get another good shot. We forced ourselves into turnovers and bad shots by not taking the shots that presented themselves. We’ve watched a lot of tape over the last week-and-a-half and it’s something we’re still working on." Memphis is 5-8 at home and out of the early playoff seeding. Oklahoma City shot the highest field goal percentage at FedExForum (.563) since Dec. 3 2010. "Losing by two or 22, losing at home, we take a great deal of pride in playing at home. It hurts," Joerger said. Those are the unpleasant details. There are also details that could pay off when health returns.Rookie guard Franklin played 15 minutes Monday against the Magic, the most of his young career. He came in at the 5:38 mark of the first quarter against OKC. He scored only six points, but played nearly 17 minutes. Forward Jon Leuer came off the bench to score 17 points. He has reached double figures in three consecutive games for just the second time in his career. Leuer is playing more than triple the minutes he played last season in the 19 games he saw action in after coming from Cleveland. "We’re down a few people. That gives us no excuse. It gives us actually opportunity," said Grizzlies point guard Mike Conley, who had a team-high 20 points and nine assists.